Simply export your model from your favorite CAD platform and import the STL files into Elsyca LeakageMaster. It is indeed as simple as that! Organizing and subdividing a body-in-white is quick and easy with the embedded pre-processing tools. All meshing happens automatically in the background, no meshing skills are required. Intelligent algorithms identify the holes in the metal sheets and generate corresponding plugs. In this way, hundreds of plugs are made available to the model in just a few seconds, and can be activated at any point in time at the user’s discretion. A wide variety of sealing measures allow to create custom sealants, such as glue lines, localized patches or cavity shaped baffles. User defined source and receiver locations allow to investigate a variety of scenarios. Run iterative simulations to mitigate the acoustic leakage by (de-)activating plugs and sealants in the model. Discover how acoustic leakage travels through the BIW structure with the help of intelligent visualization tools. Design your in-house criterion based on path-specific information to rate the leakage performance. Per project a comprehensive summary of all simulations provides a status overview, facilitating selection of the best performing configuration. Acoustic paths and the corresponding sealing measures can be exported to any CAD system to share your conclusions with your team or other departments. Much more efficient than only knowing where noise exits your vehicle is to also visualize how noise actually travels through each cavity of your vehicle. Optimizing the acoustic sealing can now be done early on in the design process! The availability of a prototype is no longer a limiting factor. Use prototypes for validation rather than optimization. Eliminate guesswork. Virtual simulation allows an unlimited number of iterations to further improve the acoustic comfort. Fine-tune the amount and location of sealing measures, unhindered by prototype availability. Profit from all the benefits of virtual simulation rather than relying purely on physical trials such as smoke or ultra-sound tests. Virtual simulation is not only fast, flexible and inexpensive, it is also so much more effective! Elsyca LeakageMaster - What is it? An interactive tool for the Acoustic Engineer to identify acoustics leakage paths, automatically create plugs and custom sealants, easily manipulate the model and verify the effect of sealing measures on the acoustic leakage. Due to the ever increasing complexity of the body-in-white (BIW), it is a very challenging exercise to understand how noise propagates through the labyrinth of the vehicle’s structure. Today, acoustic engineers perform ultrasound or smoke tests to identify these noise paths. However, this is only feasible late in the development process once prototypes are available, and moreover, the physical tests do not tell anything about the actual trajectory of these noise paths nor how to block them in the optimal way. Elsyca LeakageMaster solves these issues: starting from a computer model of the BIW, the acoustic paths are identified including the full route details through the reinforcement structures. Based on this information, the engineer can interactively choose between a variety of sealing measures, and validate the acoustic performance. Volkswagen AG was the initiator for the development of Elsyca LeakageMaster and has been a source of inspiration for continuous improvement. Volkswagen AG was also among the first to test a pre-release version of Elsyca LeakageMaster 2016. 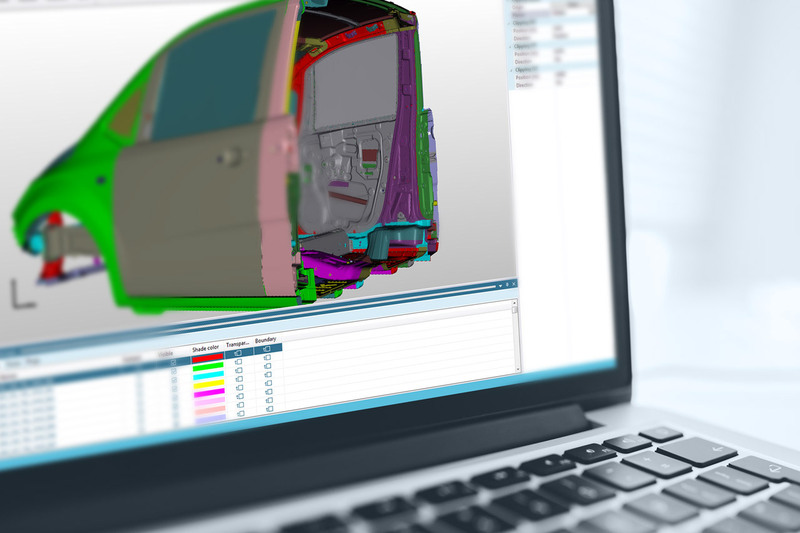 Going from the full body-in-white CAD model to simulation results in less than 1 day, Volkswagen AG was very pleased and impressed with the new import and pre-processing tools. Also the embedded “smart solutions” for custom designing sealing measures were very much appreciated by Volkswagen, together with the intuitive and user-friendly graphical interface . “It is fun to work with the new Elsyca LeakageMaster”. Enter your email and we will reply as soon as possible. © Copyright 2019 Elsyca.com - The reference in Electrochemical Software and Engineering.